A 5 p.m. deadline for filing an appeal of an environmental study on the $700 million KeyArena renovation project came and went without objection, clearing a major project hurdle and paving the way to landing an NHL team. 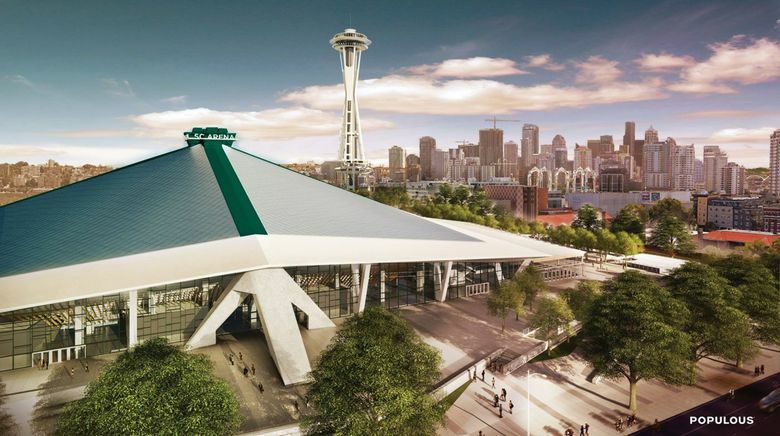 A deadline to appeal a final environmental impact statement (FEIS) on the $700 million KeyArena renovation project came and went Thursday with nobody doing so, clearing one of the most serious hurdles to beginning construction on time. The Los Angeles-based Oak View Group wants to complete the renovation by October 2020 in time to launch a National Hockey League expansion franchise at that time. OVG had built a three-month delay into its construction schedule — stretching into December — to accommodate any appeals that could have been dismissed as frivolous. A more serious appeal could have delayed construction and postponed the arrival of an NHL team by at least a year. OVG and members of the NHL Seattle group bidding for an expansion franchise had worked feverishly the past few months to head off potential appeals by working out mitigation arrangements with neighborhood stakeholders that expressed concerns about the project. Since none were filed by Thursday’s 5 p.m. deadline, it paves the way for a Seattle City Council vote Sept. 24 on ratifying the full renovation deal ahead of an October meeting of the NHL executive committee in New York City. On Friday, the council’s Select Committee on Civic Arenas is set for a final review of those documents before a vote on whether to forward them to the full council. Both votes are expected to pass rather easily. After that, the NHL Seattle group headed by David Bonderman, Jerry Bruckheimer and CEO Tod Leiweke are to give a presentation to the league’s executive committee on Oct. 2 along with Seattle Mayor Jenny Durkan. If the NHL’s executive committee approves, it would then likely hold a vote of the league’s full board of governors in Florida in early December on approving an expansion franchise for this city in time for the 2020-21 season. The city has imposed conditions on OVG that prevent demolition on KeyArena from beginning until after the NHL franchise is awarded. That would still fall under the December time frame OVG has built into its construction schedule in order to have the facility ready for the October 2020 opening date. Several clauses within the agreement between OVG and the city also allow for the construction restrictions to be waived ahead of the team being awarded if officials are convinced that one is imminent. A favorable meeting with the NHL’s executive committee and its tacit approval of awarding Seattle a franchise could potentially lead to such waivers being granted.